CrossConnections will engage Iranian and Iranian-American artists and writers in an intergenerational, creative dialogue about issues of cultural identity, preservation, and representation in a transcultural and transnational context. "Of past and present" will be the first public presentation of a series of multidisciplinary experimental collaborations exploring personal, political, and social concerns of the Bay Area Iranian-American community. The International Qajar Studies Association (IQSA) has planned, what promises to be another exciting conference on the theme of "War and Peace in the Qajar Era", at the University of Cambridge, England, on July 15th and 16th. Space to attend the conference is very limited. Only 120 seats are available on a first come first served basis. We would like our members to have first choice to attend the conference, but to do so you must register right away. Once all the seats are reserved, IQSA has no means of adding additional seating. To reserve your spot at the conference right away, please go to the following link and click on "Registration" and follow directions here. IQSA members will receive a 10% discount for the conference. If you are interested in this conference and/or interested in the activities of IQSA and wish to become a member, we have established for your convenience a web page for credit card payment. It will only take a few moments. Please go to this address. For individuals wishing to join by mail, please go to this address. print out the form and send it to us at the address on the form with your check. To benefit from the Members discount at the conference you must join IQSA before you register for the conference. Payment for the conference is a separate matter from joining IQSA. The registration page for the conference is at this address. Payment for the conference can be made online or by mail, but in either case the registration form must be sent in by mail to the address of the Cambridge Security Programme in England. We recommend that the form be sent in by "Registered mail" to ensure arrival and to have proof of mailing. Volume V of our Journal Qajar Studies is also being prepared now. It will be dedicated to the theme of the conference, War and Peace in the Qajar Era. There will also be a section dedicated to the descendants of Massoud Mirza Zell-e Soltan to honor the memory of Malek Iradj Badi-Massoud, one of the elders of the Massoud family, who passed away last month. The Journal promises, once again, to be both of the highest scholarly and aesthetic quality. Your membership and attendance at the conference guarantees you a copy of this issue of the Journal, hot off the press, to be delivered at the conference into your hands! Members who will not attend the conference will receive their issue sent in the mail beginning August 2005. Please become a member of IQSA today and register for the conference now. Lodging arrangements in Cambridge must be made individually. A suggested list of sites for hotel and B&B reservations is included on the bottom of the IQSA Conference page. If you have already become a member of IQSA, our sincere thanks. We hope to see you all in Cambridge in July. Mideastwire.com will shortly be offering a free daily email newsletter that contains translated summaries of key political, cultural and economic stories/opinions from the media of the 22 Arab countries, Iran and the Arab media Diaspora. We are looking to hire freelancers who are already reading Farsi pro/anti/neutral-government online publications, especially dailies, and who want to earn some extra money each month by translating a few key bits of a story of interest and adding some synthesis of that key story. My name is Musa Tokmak. I am a PhD. Student in Ankara, Turkey. I am really interested in Persian culture and Iran. So far I havent visited your country but in the future i hope to visit your country. Anyway, I would like to introduce a work of mine. Since 2001 I am offering some Turkish names to International Astronomical Union. Those names will be stored and then they will be used in space geograpy nomenclature. Or shortly, I offer some name to IAU - they collect names from everperson or organizations - and then they will use my offered names to any craters or valleys or mountain names for example in Mars or Venus or Astreoids.But of course there is no any guarante to be used.They gave me some permission to collect the names. Since in Turkey There arent any organizations and universities that do my job. Names can be any Iranian scientists, poets, artists, writers, etc names but the main rule is that those persons must be a dead person and well known ones.No names having political, military or religious significance may be used, except for names of political figures prior to the 19th century.Rivers, lakes, gaysers, coal field and cave names can also be offered. -- Nizami: Elyas Yusof Ganjavi; Persian epic poet (c. 1141-1209). -- Rudaki: Persian poet (c. 859-940/941). -- Rumi: Jalal Ad-Din, also Mawlana; Persian poet and Sufi mystic (1207-1273). -- Sadi: Persian poet (c. 1213-1291/1292). -- Ustad Isa: Turkish/Persian architect (17th century). -- Aramaiti: Persian fertility goddess. -- Zamin: Persian earth goddess. -- Vashti: Persian first name. -- Zeinab :Persian first name. -- Zerine: Persian first name. -- Mehseti Patera: Ganjevi; Azeri/Persian poetess (c. 1050-c. 1100). -- Tahmina: Iranian (Farsi) epic heroine, wife of knight Rustam. -- Humai: Iranian happiness bird. -- Abul Wafa :Persian mathematician, astronomer (940-998). -- Al-Biruni :Persian astronomer, mathematician, geographer (973-1048). -- Alfraganus, Al-Fargani, Abu'l-'Abbas Ahmad Ibn Muhammad Ibn Kathir; Persian astronomer (unkn-c. 840). -- Avicenna: Abu Ali Ibn Sina; Persian doctor (980-1037). -- Azophi: Al-Sufi, Abderrahman; Persian astronomer (903-986). -- Nasireddin: Nasir-Al-Din (Mohammed Ibn Hassan); Persian astronomer (1201-1274). -- Omar Khayyam: Al-Khayyami; Persian mathematician, astronomer, poet (c. 1050-1123). -- Soraya: Persian female name. -- Firdausi: Hasan; Persian author (c. 940-1020). -- Cisti: Iranian healing god. -- Zal Montes: Iranian sun god. -- Zal Patera: Iranian sun god. -- Atar Patera: Iranian personification of fire. -- Asha Patera: Persian spirit of fire. -- Kava Patera: Persian blacksmith. -- Mithra Patera: Persian god of light. -- Peri: Persian evil spirit who disguised malevolence by charm; disturbed natural elements and heavenly bodies. 3)- Who collects new names that will be offrered to International Astronomical Union (IAU): Mr. Musa Tokmak, 32, is a PhD. student in Turkey collects those names since IAU gives a permission to him. And he loves Iranian culture. For that reason he would like to this nice job. If you are interested in this topic and my "Iranian and Persian names in SPACE" Campain and , I would like you to write in your newspaper or have questions, please contact with me. I hope that you will help me. A. Einstein says "Imagination is more important than Knowledge"
Contrary to the common belief that the K-12 education in Iran does a better job of teaching math and science than that of many of the developed countries (the United States being a frequently used basis of comparison among Iranian-Americans), the TIMSS2003 study demonstrates a rather disappointing and troubling state of affairs. Briefly, Iranian 4th and 8th graders' understanding of math and science on average ranked very poorly among participating countries in 2003. To see the results of this study, click on the Mathematics Report and/or Science Report on the following website, and then browse through Chapter 1 of both reports to view the ranking tables (Chapter 2 contains more detailed ranking info). You might also want to read through the methodology and other sections to evaluate for yourself the level of accuracy and/or bias in this study. The fact that a few talented Iranian students perform well in international science and math competitions (often after special, intensive training), or that talented, privileged, and well educated Iranians are over-represented outside the country should not hide the problems average Iranian students face with regards to math and science education inside the country. In my opinion, Iranian education authorities should be applauded for taking part in this study. I only hope that they acknowledge the results of this study and work harder to improve the quality of math and science education in Iran. In drawing attention to the missing "Palestinians" in Hoder's bla on the relationship between Israel and Iran, one must keep in mind the context in which such proclamations find themselves. Unlike the eternal chapuls whose existential demands it is perhaps that leads them again and again on the anti-Imperialistic thirdworldist side of the political spectrum, despite the fact that it is because of the very imperialistic and first-world situations in which they find themselves, that provide the very condition for such joftaks, in Hoder's recent blas one cannot but notice a pattern of attempts to distance himself from those he dismisses as "hezbollahis." This may have to do with the Zeitgeist on the streets of the internetted Shomalshahr and the wanna-be-but... susuls and reformed hezis who make up the bulk of the bla-ers' readership, but in any case as Peyvand Khane Khorsandi implicitly points out with his pro-Pal proclamation out of the chapuls without borders greenwich time Kritik standard: this tendency in the neo reformollahis, while it on some level has been quite reasonable not only yesterday, but as Hodi quite unwittingly but Drakhshanly points out, has always already been reasonable from the perspective of the Iranian plateau for at least some two millenia and a half, is but a straddle down a very slippery aporia... What then makes the connection unmerry, and Peyvand un-Khorsand, is the realization of what may lay at the otherside of these trial blas... the unmistakableness of what perhaps someone working for slick Willy would come up with... "It's about the IR, stupid!" And so, it is no wonder that Khorsandi's reading of Derakhshan, misses the words, Islamic Republic. Israel, writes blogger Hossein Derakhshan, is “the key” to Iran’s future [read here]. The Islamic Republic, he says, should forge a strategic alliance with the “Zionist entity”, just as the UK has done with the US. 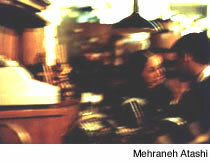 He goes so far as to suggest that more Iranians should “wherever they are go out of their way to become friends with or even marry a Jewish person.” His idea is based on an over-reading of the significance of the disputed handshake between Khatami and Israeli president Moshe Katzen at the Pope’s funeral. Derakhshan writes daily so it is easy to get sloppy, but his failure to mention Palestinians even once in his entry cannot go unnoticed. Perhaps it is the key not to Iran’s future but his that Israel holds. It was early morning when the warm sun peeked through the curtains. Parizad lay half asleep and was hesitant to rise from her sweet slumber. What she experienced in her dreams was far more enlightening than her external world. She tossed left to right and with every turn his image was present. It was forever embedded in her soul. Ever since Anaoshak's departure from this world, Parizad maintained a secret rapture. She was held ransom to his fate and knew that this on going vigil soon had to end. Each night when Parizad shut her eyes, she and her beloved reunited in a state of boundless unconsciousness. Hand in hand they would glide over the starry veil of the sky. They soared over the snow peaked mountains and drank from the pristine waters that shimmered like gems under the moonlight. All the night the lovers ascended in a celestial bliss only to be brought to the end of another day. How could Parizad continue in this nightly existence that one day would cease? She wanted to dwell forever; day and night, winter and fall, in his divine world. Another day ended. She laid her head upon her lavender scented pillow and prayed that he would appear in her dreams as he always did. She shut her weary eyes and entered into a deep, euphoric slumber. There was nothing present but void. Her beloved did not enter her dreams that night, nor many a night after that. She was intensely dismal over his absence from her material world, now completely somber over Anaoshak's nonappearance from her dream world. It is with deep sadness that I like to inform the lovers of persian music and poetry of the passing of my father Ismail Navab Safa. A poet of particular sensitivity and a pioneer of modern persian lyrics, Navab Safa was born in Kermanshah in 1924. His father was a member of a prominent Isfahani family that was related to Neshat Isfahani, a well known 19th century poet. 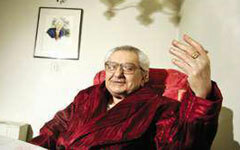 He was only twenty-years old when he wrote his first song for then famous Iranian singer Roohbaksh. Many of his works are among the most memorable songs written for his generation and beyond. In his long career Navab Safa worked closely with great masters of traditional persian music among them Abolhassan Saba, Rouhallah Khaleghi, Hossain Yahaghi, Mehdi Khaledi, Parviz Yahaghi, Morteza Mahjoubi and Majid Vafadar. His prolific body of work includes such great songs as Amad No Bahar, Koja Miravi, Ashofteh, Javani, Niloufar, Raftio Baz Amadi and Raftamo Bareh Safar Bastam. Ismail Navab Safa was among the first few individuals who helped with the establishment of modern radio in Iran. He was a member of radio Iran's the editorial board. In that capacity his contributions include the creative concepts behind many well known radio programs including Karvani Az sher va moosighi, Dar Goosheho Kenar Shahr and Ghesseh Shame. Navab Safa held many governmental positions including director general of radio stations in Zahedan, Gilan, Azarbaijan and Isfahan and was director of public relations for the city of Tehran. He was elected member of parliament from Isfahan in the last majlis under the Mohamnmad Reza Shah, a position he resigned from just before the 1979 revolution. Navab Safa has published as well as authored many books including the biography and memoirs of Farhad Mirza a Qajar prince, Takderakht ( named after a song he wrote for Pouran) which is a collection of his ghazals and lyrics and Ghesseh Shame, a personal history.